The Annual Adm and Technical Inspection of the school was held in APS Mathura on 19th & 20th Feb, 2018. It was carried out by the team consisted of Brig. Anmol Sood , VSM Dy Goc, 23 Inf Div, Col H.S. Sodhi , Addl Dir Awes, Lt. Col. Satyavir Singh, Edn Offr, HQ 99 Arty Bde and Mr. Abhay Singh, Principal APS Ranchi . The team was formally welcomed by the Principal, APS Mathura. Thereafter, the team visited both the Junior and Senior wings. They witnessed the morning assembly of Senior Wing on 19th and Junior on 20th Feb, 2018 where a short cultural program was fielded as a gesture of welcome by the vibrant stars of the school. The team visited the School premises including all the Labs and Library and appreciated the efforts of the School Management. The inspection ended up with a happy note over a cup of tea and staff interaction with the inspecting team. Sports competitions inculcate the spirit of positive challenges & sportsmanship among the students and prepare them for the life ahead. (a) Fly High Badminton (Open Tournament) was held on 19th-21st Jan,2018 at Ganeshra Indoor Stadium, Mathura in which Yashi of class VI and Vedansh of class IX stood as Runner-Ups (under 15 category) whereas Sonia of class VIII was IIIrd Runner-Up in Women’s Open. (b)Yudhgyan District Karate Competition was held on 21st Jan, 2018 at Crecent Garden, Civil lines, Mathura in which Gold Medal was bagged by 5 students whereas 4 students secured Silver and Bronze Medals. 2.U.P. State Championship was held on 14th Jan, 2018 at Jawaharlal Nehru Stadium, Ferozabad in which 3 students of our school won Gold Medal in 200 mt whereas 2 won Silver in 100,200, 400 and 1500 mt each. Bronze Medal was also bagged by 3 students in 100 mt, 1 in 400 and 800 mt. The winners were felicitated by the Principal and the school is proud of them as our students left no stone unturned in bringing glory to the school’s name. “Goodbyes are never easy but a very important act in ‘ passage of time.’ There is a tradition in every school that the juniors bid farewell to the outgoing class. The students, staff and management of APS Mathura bid farewell to yet another promising batch of Class-XII on 31st Jan,2018. The farewell ceremony was organized at Tarapore Hall, Mathura cantt with the honorable Patron as the Chief Guest and the Principal as the pioneer of the school wherein they showered their blessings. The program commenced with the formal welcome followed by a welcome song being sung in honor of our Chief Guest, Maj. Gen. V.D. DOGRA, PATRON APS MATHURA. 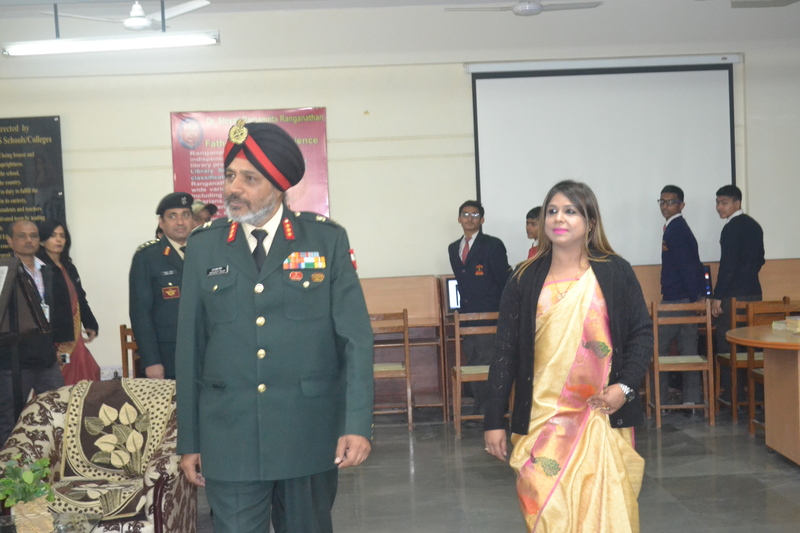 Then the auditorium was set ablaze with a ramp walk and self- introduction by class-XII nominated students for the race of Master and Miss APS Mathura Cantt. followed by stupendous cultural programme. Thereafter the Talent and Questionnaire Round were conducted wherein MALVIKA KAMAL and ARCHIT TYAGI were crowned as Ms. and Master APS, Mathura. Then incredible dance number presented by class XI girls and the pick of the day was the BHANGRA presented by the boys were well applauded for their rhythmic dance steps. The citations were given away by the Honorable Chief Guest to each student of the outgoing batch. The day was a fiesta devoted to the years Class XII students spent together with friends and teachers to reminisce joyous moments. They praised and thanked the school for the high standard of upbringing and the values that had been imparted to them. The event ended with the inspiring speech delivered by honorable chief guest. The priceless words of Sir encouraged the students to live their dreams and face the challenges of the future fearlessly, to aim high and believe in themselves to achieve the heights of success. The vote of thanks was proposed by Devika Ramnathkar, Head Girl of the school.After that everybody moved for lunch. Then class XII students took leave from their teachers and friends with a heavy heart.